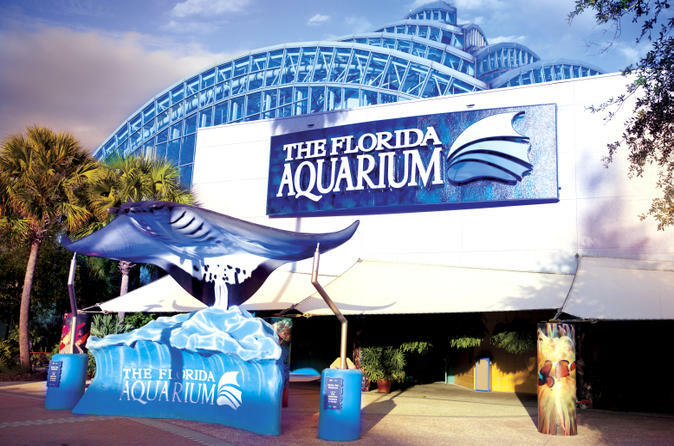 Explore and learn about more than 20,000 sea creatures at the Florida Aquarium in downtown Tampa. Touch a bamboo shark or a sea star. Discover reef fishes, corals, giant clams, tortoises and more from Florida’s waters and around the world at this Tampa Bay attraction. The Florida Aquarium experience is designed to take you on a journey, starting with a drop of water from one of Florida's many freshwater springs, all the way out to the open waters of the Florida Keys. Sights include a large simulated wetlands environment located under a tall glass atrium, shallow bays and beaches, and a coral reef ecosystem encompassed in half a million gallons of natural seawater. Your visit to Tampa Bay isn't complete without exploring the one Bay Area attraction that opens a window to the side of Florida that few ever get to see. The Florida Aquarium offers a dramatic and unique look at all that swims, floats, preys,and crawls in and around Florida waters and beyond. The Florida Aquarium features 200,000 square-feet featuring beautiful exhibits full of animals from Florida and beyond to enhance the experience of your visit. Home to more than 20,000 aquatic plants and marine animals from Florida and around the world tells the story of water’s journey to the sea: from a single drop of rain to the deep waters where the ocean’s top predators are found. Along the way, see river otters, alligators, stingrays, and sharks! You will experience our 500,000 gallon floor-to-ceiling Coral Reef tank and exit through Ocean Commotion. You can also meet a penguin up close or watch the children splash the day away in our outdoor water fun zone: Explore a Shore!